While 3D movies are already experiencing something of a backlash, technology vendors are still pushing forward with 3D content -- trying to persuade us that 3D is to 2D what talkies were to silents. One of the latest 3D-related products to hit the market is Fujifilm's new FinePix Real 3D W3 digital camera, a point-and-shoot camera that lets you capture both still photos and videos in 3D. It will ship in early September. I had a chance to play with the W3 at Fujifilm's press event last night, and I have to say that, although it's definitely not cheap (with a list price of US$500) and offers only 3X optical zoom, it's a lot of fun. The two lenses and sensors are located on the front of the camera, behind a cover that slides down to both reveal the lenses and power up the camera. On the back of the camera, to the right of the 3.5-in. display are two control wheels. The top lets you choose among various 3D and 2D modes (such as Individual Shutter 3D, which lets you control the 3D manually by taking two separate shots, something that takes a lot of practice). The lower wheel handles such tasks as delete, flash on/off, etc. ; a button in the center of the wheel lets you access the menu. There are also two buttons that let you switch from 2D to 3D or from still photos to videos, a play button and a display/back button. A "manual parallax control" on top of the camera lets you adjust the two lenses to compensate for lighting and your own visual quirks. A memory card fits into a slot at the bottom of the camera. 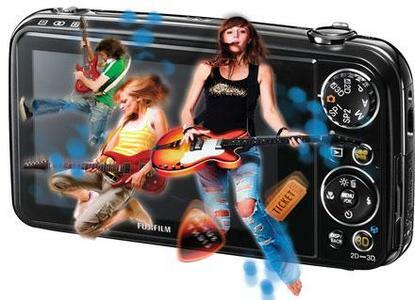 According to Fujifilm, the camera weighs 8.5 ounces with battery and memory card. I found it lightweight and easy to hold, but a number of the others who were trying out the camera complained they were having trouble keeping their fingers from blocking the lens. I had no such difficulties. The W3 provides its 3D photography by using two separate 35mm-105mm lenses, along with two 10-megapixel CCD sensors. At the most basic level, taking a 3D photo is not hard: You make sure the LED next to the 3D button is lit, point the camera at your subject, make sure you're within six feet of the closest object (because otherwise, the 3D will not work as well) and press the shutter. Taking a video is also simple: Just hit the video button and press the shutter. Interestingly, you can actually view your photos and videos in 3D; the camera's display is an autostereoscopic 3D widescreen LCD with 1150K resolution. (Autostereoscopic 3D is an older technology that allows you to see 3D without needing special glasses.) This worked quite well, although I found it a bit deceptive; for example, a photo I took of a photographer with a long telephoto lens pointed at me looked great on the W3's display. But when I plugged the camera into a 3D TV later using the camera's HDMI port, and viewed the same photo using glasses, there was very little depth, probably due to the fact that my subject was more than six feet away. Of course, it isn't unusual for images to look different on the camera's tiny LCD and on a larger screen; still, the addition of 3D means that you have to be even more careful about examining your results. However, on the whole, the 3D photos that I took using the automatic settings actually came out pretty well. The images were crisp and clear, and the depth was quite perceptible. However, when I started playing with some of the manual controls for depth and accuracy, I realized that I'd need some time and practice before I could use them with any kind of accuracy. Using the camera to shoot 3D video was also fun, but the results were more mixed than that of the still photos. Not only did it vary more with the available lighting, but I found that moving with the camera caused more blur than the typical 2D video camera. On the other hand, if I stood still and simply videoed the people moving around me, the results were much better. It would have been interesting to try to capture a more fast-moving object, such as a bird in flight. There were actually 2D aspects of the camera that I felt were as nice, if not nicer, than the 3D aspects. Because of the two lenses, you can take two 2D photos nearly simultaneously, one with the flash and one without, take the same photo in color and black and white, or take the same photo in zoom and in wide-angle. Who is this for? First, consider that you need to have a 3D TV to appreciate most of the photos that you take with the W3. (You won't be able to view the MPO-format 3D photos at all on your computer, unless you've got an Nvidia Corp.'s 3D Vision technology built in.) You can also get 3D prints of your stills, but at $6.99 for a 5x7 photo, you're not going to want to buy lots of them. Patience is also a necessity; it's going to take a while to explore the best way to handle the settings. However, amateur photographers and bleeding-edge tech enthusiasts who want to play with the new technology will love the W3, especially if they have a 3D TV at home and can afford the camera's premium price. And even if you don't want to buy one, you may want to try this out at your local camera store, just for the fun of it. Barbara Krasnoff is reviews editor at Computerworld. When she isn't either editing or reviewing, she blogs at The Interesting Bits ... and Bytes; you can also follow her on Twitter (@BarbaraKrasnoff).